Note: As Karl pointed out in a comment, this is actually a complex solution. It is a good solution for two or more columns, but if you have one column as shown here, the simplest approach is to just sort the column and the blanks and cells with one space in them will be grouped together. Delete those cells and you get the same result. I'm going to a big blues dance event this weekend. The people signed up are listed on EventBrite, so since I wanted a list of people coming, I copied the list and pasted it into OpenOffice. But when I pasted the list to a spreadsheet, I got a bunch of blank cells. I want to have a nice singlespaced list of the names. By the way, Edit > Paste Special, Skip Empty Cells, won't do what I want. It's a badly phrased option and has to do with whether you overwrite when pasting. Anyway--so to remove the empty cells I selected the column and chose Data > Filter > Standard Filter. I made sure that the Name column was selected, left = selected, and selected Not Empty. I clicked OK and....voila. Voi not, that is. That pesky EventBrite site puts in a space, just a single space, in some but not all of the empty lines. Why? Well, why not. I discovered this by clicking in the remaining seemingly empty cells, and yep, there was a blank space. So now I need to screen out not only stuff that's not empty, but stuff that doesn't have a space as the only content. That's a little hard....and I don't want to search and replace to remove spaces, since then I'll end up with TrentPrice instead of Trent Price. I went back to Data > Filter > Standard Filter and filtered out everything that STARTS with a single space. 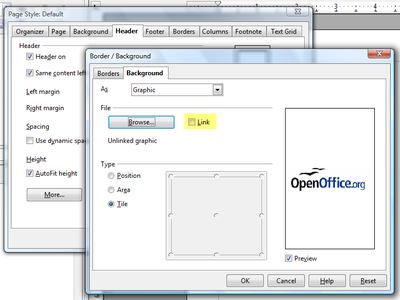 As I posted yesterday, you can use OpenOffice.org with most of the templates out there. Writer/Word, Calc/Excel, and Impress/Powerpoint. 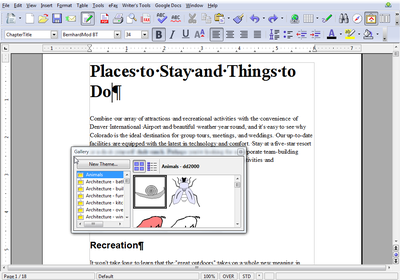 Also remember that OpenOffice opens .docx files without any extra help. Here's the only difference: it's after you've saved it. 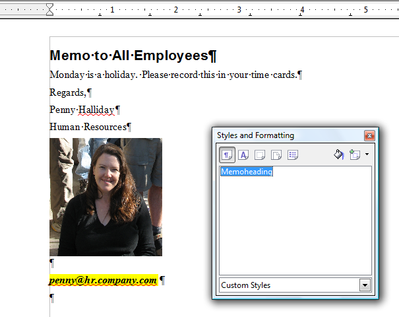 Instead of being able to access it the way you do with Impress, you choose File > New > Templates and Documents to get it. Then you'll see a window with all your templates. It might be in a folder of templates like My Templates or it might be at the top of all your folders. You can tell by the info in the title bar. 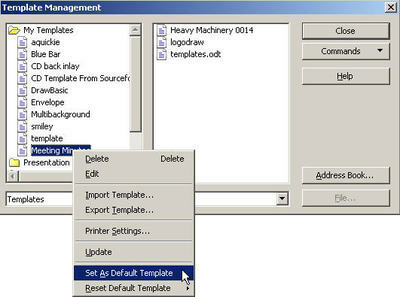 The template will be in the folder you picked when you chose File > Templates > Save. Then just double-click and you're good. 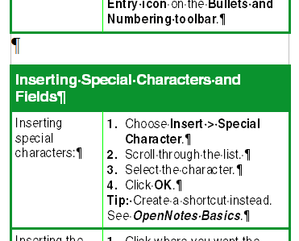 As you know, OpenOffice doesn't come with the dazzling depth or array of templates that Microsoft Office users get. However, here's the thing. A) Templates aren't software. 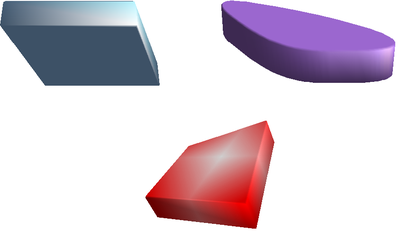 You can get great free software, without many templates, then go out and get the templates separately, also for free. 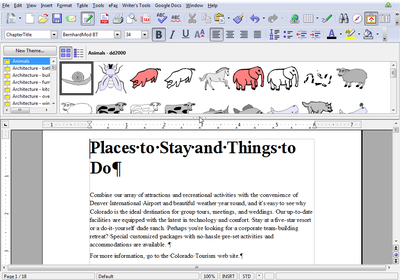 B) You can use Microsoft Office format templates to your heart's content in OpenOffice. So here's what I just did. 1. 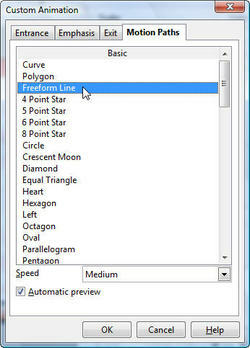 Googled free Microsoft Office templates. 4. 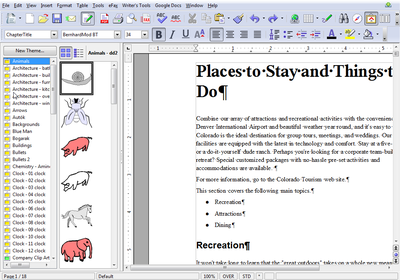 From OpenOffice, chose File > Open and opened the downloaded file. 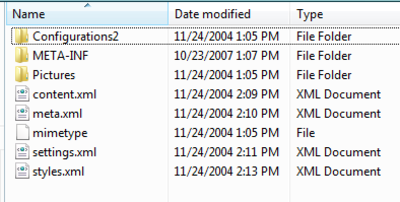 I choose File > Templates > Save and name it, then click OK.
6. And now (without restarting or anything) when I choose in OpenOffice File > New > Presentation, that wedding template is right there in My Templates. Things don't always work the way you expect. However, it's easy to make things work the right way with spreadsheet cells once you know how it works. Let's say you want the day first, so that 12/1/10 is January 12th, not December 1st. You do this under Format > Cells. However, if you just change the format to DD/MM/YY manually, you might get some unexpected results. It's usually better to just switch the country/language for those cells. Here's why. We'll start out "normal" with standard American English formatting, MM/DD/YY. So switch the language to one that uses the date format you want. Then what you type stays in the same order. I've added a Search This Blog field to both sides of my blog. Apologies for the years of lame or no search functionality! Sometimes your data isn't as broken down, as granular, as you'd like. What you typically want, for the most power over your data, is this. 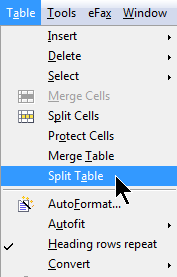 Here's how to split it automatically, not manually. First, you need to take out that space between the comma and the first name. Select all the cells in that name column. Choose Edit > Find and Replace. Type a comma immediately followed by a space in the Search For field and just type a comma in the Replace With field. Click More and select Current Selection Only. And you'll see the data looks like this. Now you're ready to split it at the comma. First, be sure that you have an empty column to the right of the Name column, to put the first name and initial into. 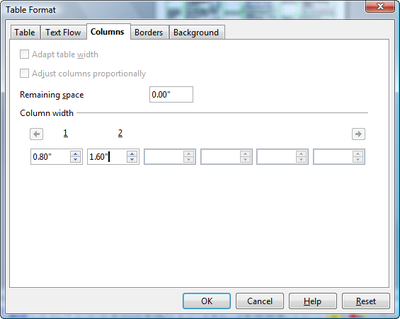 Then click on the column header to select the whole column. Choose Data > Text to Columns. Select the comma, but nothing else. You'll see a preview of how it will be split. Then click OK and you'll see the actual data split. Let's say that you have a whole bunch of data. 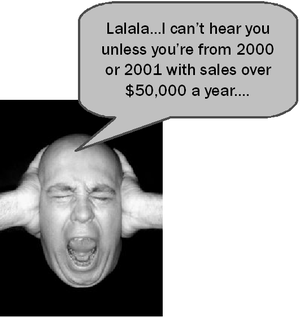 You're the head of HR and you have thousands of employees. You want to figure out which ones you need to talk to about new benefits because they've changed their health insurance plan from one year to another. You just need to figure out which are the ones who changed. How do you do that? You create a query that says "find me all the people for whom Plan08 field does not equal Plan09". OK, good. But what's the syntax? and then you just put square brackets around the fieldname. Here's some example data. You need to have the fields set up so they have the value for each employee's choice for health plan for 08, and then again for what they're switching to for 09. The data needs to be in or connected to a database file, an ODB file. 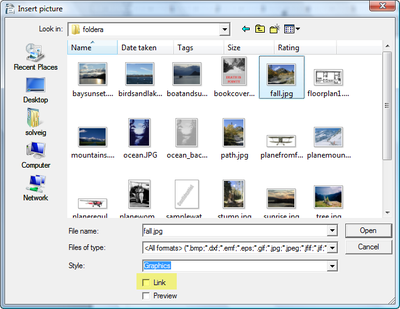 Then you open your database .odb file containing that data, and you click the Queries icon at the side. You have to create the query in design view or in SQL view, you can't use the wizard. In design view it's as I showed before, and in SQL it's just "Plan08" <> "Plan09". Here's how it looks in design view. and here's the results when you click the green-checkmark Run Query icon. Let's say that you work at one of those companies that has a nice leftover-from-the-8-character-file-name-limit-days email format. Solveig Haugland becomes shauglan, Bob Nelson becomes bnelson, and so on. And let's also say, as long as we're dreaming up situations, that you've got a spreadsheet full of first and last names but you don't have their emails. You could type in all the email addresses but even an intern who's paid well by the hour is going to balk at that. The faster way is to use CONCATENATE and LEFT. Never retype when you can do it quicker! 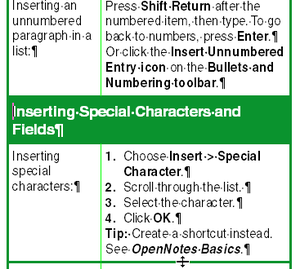 In OpenOffice.org Calc spreadsheets, as in Excel, you can click on a cell, find the little black handle in the lower right corner, and drag it up, left, right, or down, to get additional content. If it's a number when you drag you'll increment by 1. If it's a value like the days of the week or names of months, it will increment as in January February March. 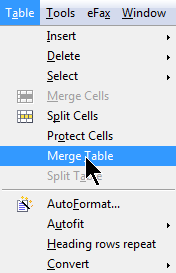 Drag down and you get similar formulas referencing the next-door cell, not the original cell. If it's anything else it will just repeat. - Or you can hold down Ctrl when you drag and it'll do the same thing: repeat instead of incrementing. This works for incrementing months/days etc and numbers. 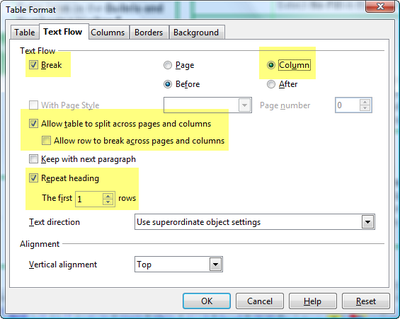 Note: for formulas, if you want them to not adjust as you drag, you use absolute references as in Excel. $A$4 instead of A4 for instance. There's just one more thing to mention: creating your own custom sort order. Existing sort orders are things like Monday Tuesday Wednesday (the right order, which is not alphabetical). But let's say you've got things you want in a certain logical but non-alphabetical order that aren't already set up in OpenOffice.org: titles of books or people, procedures done in a certain order, or your own abbreviations for the days of the week. You can create sort orders for those very easily so you can sort by them. Let's say you've got this data. This is the right order. If you had them out of order, though, and wanted to sort them, all you'd have the option for is alphabetic. Which isn't right. So you create an order to sort them by. Select just the content of the sort order, nothing else. Be sure it's in the order you want it. 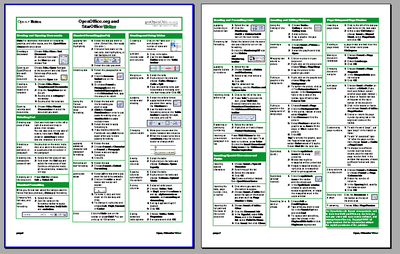 Choose Tools > Options > OpenOffice.org Calc > Sort Lists. The list will appear. Click OK.
Now just sort the way you would with a custom sort order. You'll see your new sort order in the sort window. Sort orders are nice for quick data entry, too. If you type the first word for a sort order, then find the small black handle in the lower right corner of the cell and drag, you'll be able to easily fill the cells with the rest of the content in the sort order. The data will fill in each cell you drag through, in the order set up in the sort list. Back in the good old days of 1.x, you could draw a line, then draw an object, and make the object move along whatever line that was. It was great. Then the lovely redesign of Impress came, and that user-defined motion path feature got lost along the way. It was a sad time. However, now in 2.3 it's back! It works slightly differently, but it's great. In addition, you can edit the existing motion paths like the stars, etc. Here's how it works. Draw an object, then under Custom Animation’s Motion Paths tab, select any one of the first three effects. 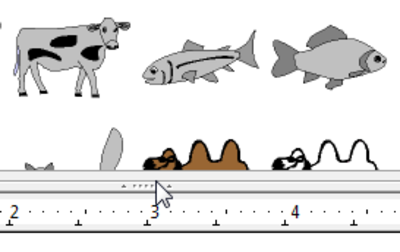 Your cursor will change so that it will draw the kind of line you selected. Draw the path that you want the object to follow. Then run the presentation to see the effect. 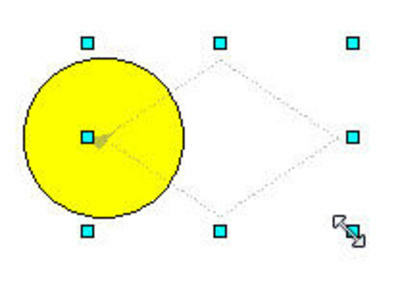 To edit existing motion paths, just apply a standard motion path like Eight-Point Star or Diamond. The path will appear in the slide. 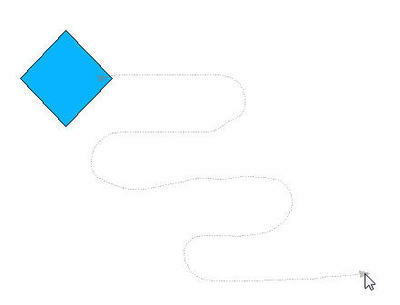 Click on the path and expand it; you’ll get another path (there’ll be two diamonds, for instance). Delete the old path, and you’re good. If you find yourself emailing versions of a presentation around to collaborators, consider one or more of these instead. They're online sites that let you share your presentations. 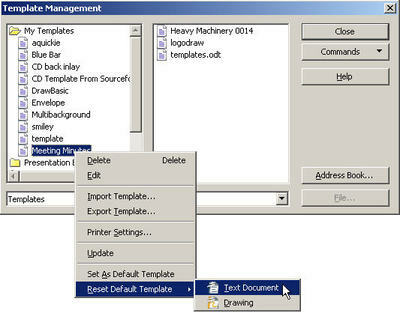 You can copy and paste into a new blank document, of course. You can click the Upload tab and get this window. 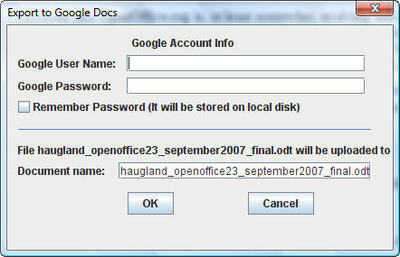 And there's a nice little extension for OpenOffice.org that when installed will give you a menu for uploading your docs to your Google account. 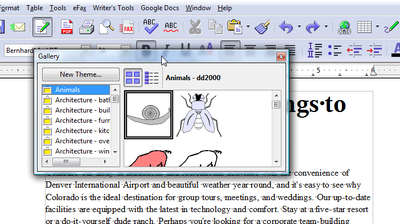 When you're editing a document, there's this option. In the main window, there's this option. 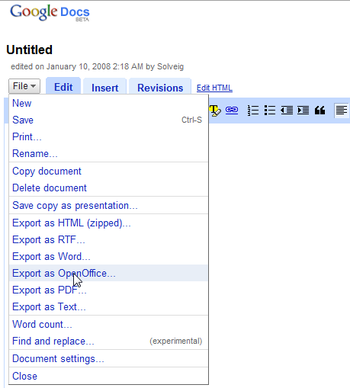 This blog shows how to get your Google content for Google docs as well as other Google web apps like AdSense. Some people are having problems inserting data from a CSV or TXT file into a spreadheet, using Insert > Link to External Data. 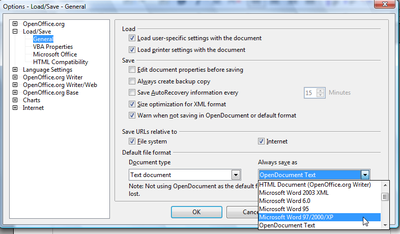 If this doesn't work for you, try Insert > Sheet From File instead. 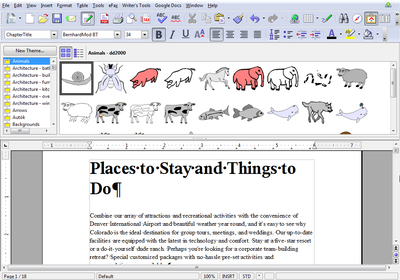 Help Digg the Great Story about OpenOffice.org 2.3! 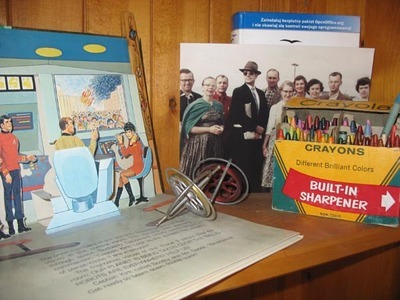 There's a great story about OpenOffice 2.3 in EWeek. Give it a read, and Digg it to help draw attention! Using regular expressions in OpenOffice Calc filters -- phrases like "contains" rather than equals, less than, etc. Life just isn't cut and dried. Sometimes when you're filtering you don't want to just say "give me all the people whose last name is Hanson." You want Hanson, Hansen, and Hansengaaardennn (those Dutch really go for the jawbreaker names). You'd like to filter out everyone except those whose names contain "Hans". Here's how to do that. Select the item in the Comparison Field from the dropdown list in the standard filter, then type what you want in the other field. 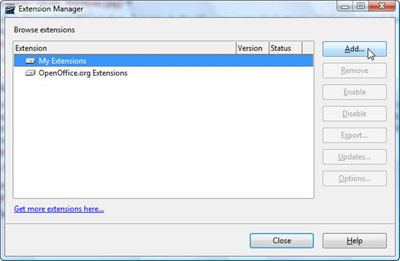 Click More, and select Regular Expressions, then click OK. Select all the data, or just click in the headings, and choose Data > Filter > Standard Filter. Make the window look like this. Here's a different example. I want names that DON'T CONTAIN the series of letters Hans. Here's some information from the OOo wiki about regular expressions. In the Standard Filter you only have three slots for info. That's a bit limiting. So the Advanced Filter lets you enter up to 8 criteria. Here's your data. Click the image to see it larger. Now, here's how you enter your critera. Copy your headings and paste them somewhere else in the spreadsheet. Then type the values you want. Click this image to see it larger. I've entered Fargo for the city, ND for the state, and =>5 for the Years of Service. Note that they are all on the same row. This means they are ANDed together. Click in the data (not the criteria but the main data) and choose Data > Filter > Advanced Filter. In the window, click in the right-hand field and draw a box around the area where you typed the criteria. Click OK.
Now, if you want OR logic, just enter the values in your critera section on different rows, like this. Click to see a larger version of the image. These are the corresponding results. Because of the OR, you get a lot more results. Click the image to see a bigger version. To turn off the filter, it's the same as with the standard filter. Click in the filter results, and choose Data > Filter > Remove Filter. The Autofilter is a quick way to restrict what you're looking for. If you need some more flexibility, though, you need to move on to the Standard filter or the Advanced filter. Maybe you have people from 12 states and you want to see the ones from Ohio OR Montana OR New Jersey. Or you want to see people with five or more years of service. Or you want to see anyone with more than three overdue library books who is also from Denver, because you're traveling to Denver and you want to drop by their houses and scare the heck out of them in person. These are a challenge for the AutoFilter, so you move on. Here's how to use the Standard Filter. Let's say you've got this data. Click somewhere in the data and choose Data > Filter > Standard Filter. In the window, enter your data. Note that any ORs will open up the results more than you might expect. Here's a filter. Either from MT or OR, and with 5 or more years of service. "anyone from Oregon who also has 5 or more years of service." As with the AutoFilter, you need to click in the filter results to take away the filter. If you don't click in the filter results, as shown, the Remove Filter option is dimmed. 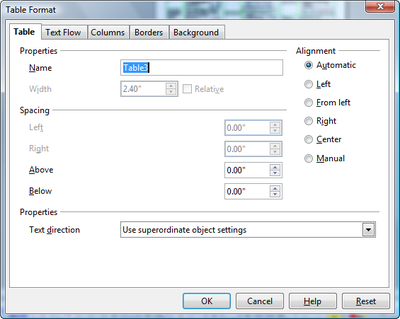 Click in the filter results, as shown, and choose Data > Filter > Remove Filter to get rid of the standard filter. Sooner or later, you're going to get a huge spreadsheet with way too much data to scan visually. How do you, ahem, filter out what you don't want to see? One way is to use the AutoFilter. Let's say you've got this spreadsheet of employees. You'd like to just take a look at those from Montana, or those with a particular number of years of service. Something like that. Click somewhere in the data, and choose Data > Filter > AutoFilter. You see arrows by all the headings. Click on one of the arrows, and choose to view all records containing one of the values, or all records containing the top 10, i.e. the ten most frequently occurring values in that column. Here are the results for selecting one value for one column. If you choose another value in another column, then you get rows that have the selected value for BOTH columns. Here, I get rows for people who are in Montana, AND in Kalispell. Which works out fine since Kalispell is a city in Montana. However, if I choose to view records for people from Montana, and from Portland (a city in Maine and in Oregon but NOT in Montana), I get nothing. To go back to viewing all the values, select All from the list. Then you get to view all the records again, once you've selected All for any columns you restricted. When you're done and want to get rid of the little arrows, click somewhere in the data, and choose Data > Filter > AutoFilter again. There'll be a checkmark and when you select AutoFilter, it will go away. There's the data the way it was before you started. Here's where things get a little twitchy. What if you try to turn off the AutoFilter and you have not selected a cell somewhere within the AutoFilter results? 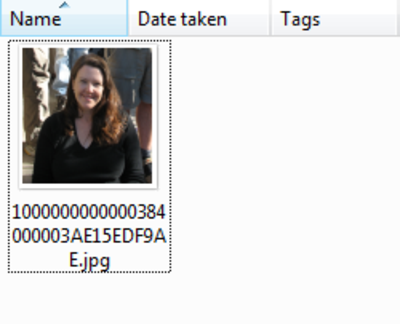 When you get this, click OK and click somewhere in the data. Then choose Data > Filter > AutoFilter again. You won't see the checkmark, but that's OK.
Then choose Data > Filter > AutoFilter yet again. This time you'll see the checkmark. And then the arrows will disappear and you're back to normal. I also recommend liberal use of the Undo feature, Ctrl Z or click the Undo icon. You can undo at least 20 and possibly more depending on how your system is set up. Can You Delete Rows When in the AutoFilter Without Deleting the Intervening Data? I'm glad you asked. Yes, you can. Here's a demo. Look at the range from row 15, Dan Montbatten, to row 20, Beth Jerlin. They're both from Montana. In between you've got Jon, Marcus, and Kyle. I'm going to view only people from Montana, which includes Dan and Beth but excludes the three rows between. Now I'm going to delete Dan and Beth. And they go away. However, Jon, Marcus, and Kyle are still there.